Polar bears rely on seals for the most part of their diet. While they eat just about any kind of seal, polar bears do have special preference for a few seal species. For instance, they love to feed on ringed seal and bearded seal. Ringed and bearded seals are the top menu items of polar bear’s diet. 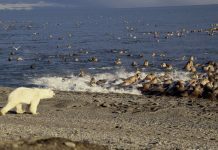 According to an estimate, the entire population of polar bears eats one million seals a year. That’s pretty much! Let us see now what kind of seals do polar bears eat in the tundra. What Kind of Seals Do Polar Bears Eat? As I said before, polar bears consume any kind of seal species no matter what. However, there are certain seals which are probably much more nutritious than others. But polar bears need them all to survive in the Arctic. Perhaps the most widely distributed seal species is the ringed seal which occurs in millions in the Arctic waters. But they also make up the essential and major portion of the polar bear’s diet. There are two reasons as to why polar bears like ringed seals the most. First, ringed seals can be easily found as compared to other seals since they are most common. Secondly, they are smaller in size in comparison to the bearded seals. Not only do adult polar bears consume adult ringed seals, subadult bears can also fancy their chances feeding on adult ringed seals. Apart from ringed and bearded seals, polar bears also prey on harbor seal, hooded seal, and harp seal. On the contrary, bearded seals (which are also quite abundant perhaps not as much as ringed seals) are not only bigger than the ringed seals—they grow pretty quickly. 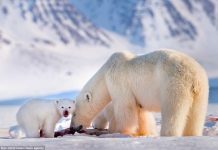 Once they reach adulthood they become less vulnerable to the polar bears—at least to subadult bears. The adult bearded seal averages 500 – 800 pounds. Nonetheless, adult polar bears know it all too well. They mostly go for bearded seal’s pups which are easy to prey on. However, if a bear catches an adult bearded seal it can go by weeks without hunting anymore. It’s as if the bear has consumed 6 to 7 ringed seals at one time. Apart from ringed and bearded seals, polar bears also prey on harbor seal, hooded seal, and harp seal. They will eat seals in spring and summer because winter comes with the frozen arctic waters. Hooded seals are pretty hard to find as studies suggest that polar bears are able to eat hooded seals only 20 days in a year. As it turns out, hooded seals make up only 2 – 3 % of the bear’s diet. Hooded seals are also pretty much bigger and heavier than the ringed seals so only adult polar bears can afford to take down adult hooded seals. What Seals Do Polar Bears Eat? – Video shows a hungry polar bear catches a ringed seal and surprises the seal with its attack! You Might Like to Read this Too! 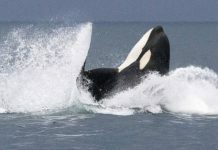 Do Polar Bears Eat Whales?